Could Kanye West be let off the hook? 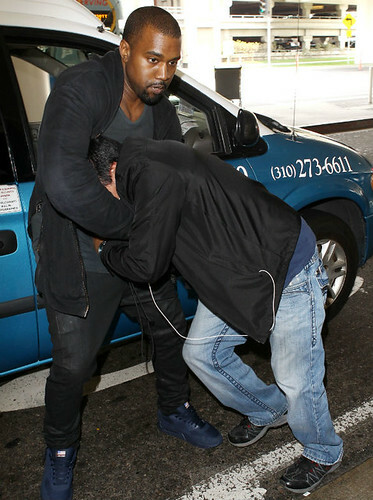 Hip Hop artiste Kanye West got himself into hot water with the law but may not face felony charges of attempted robbery after attacking paparazzi at Los Angeles’ LAX Airport on Friday, July 19. The troubled rapper, who became a father for the first time on June 15, attacked and tried to wrestle the camera from a photographer – known as Dano – who tried to snap his picture as he tried to leave the airport. The photographer is said to have been injured in the incident which was witnessed by several other persons. The extent of his injuries was not known. The incident was also filmed by other paparazzi on hand. There had been suggestions that the rapper would face felony charges of attempted robbery but now reports say that the Los Angeles District Attorney says there is not enough evidence against West. According to celebrity website TMZ, the paparazzo’s next option could be to pursue a criminal battery case which would see West paying his way out of a civil compromise. This is not the first time that West has found himself in problems. The outspoken artiste once said of then-US president George Bush “George Bush doesn’t care about black people” during the relief concert to raise funds for victims of Hurricane Katrina back in 2005. ← ‘The chicken or the egg’ dilemma solved!